Chlorella Powder is made from a green, unicellular species of freshwater algae. Certified Organic and Raw Chlorella Powder. 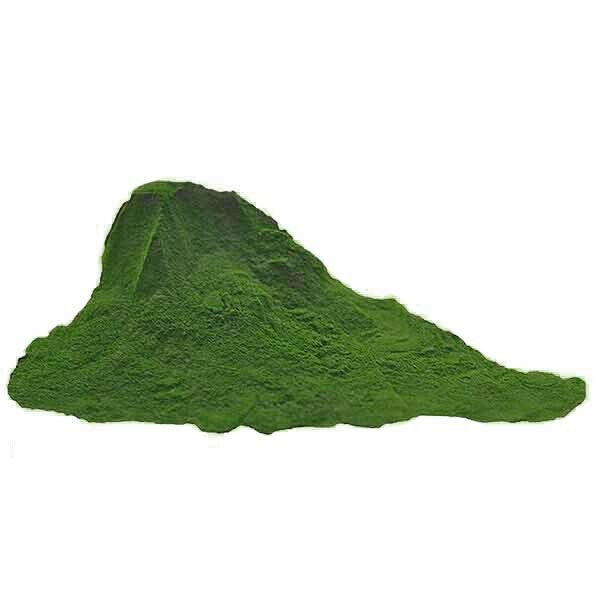 Chlorella powder contains the naturally occurring plant pigment, chlorophyll, which is often regarded as a important element for detoxification and is also responsible for giving chlorella its striking blue-green colour. This certified organic and raw chlorella powder is carefully washed then dried, maintaining the key nutrients. It is then milled to break the insoluble chlorella cell walls. This broken cell wall variant of chlorella makes the nutrients more accessible without losing any of the nutritional benefits. Contains vitamins A, B9, C, E and K.
Contains the minerals, calcium, magnesium, iron, phosphorus and potassium. Contains trace elements, omega 3 fatty acids and chlorophyll. Is certified organic by "Organic Farmers & Growers". Stir 1 teaspoon (2-3 grams) of chlorella powder into your favourite smoothies, shakes and juices for example, or use it to enhance your choice of (rawfood) recipes, such as, sauces, nut butters and salad dressings. Try chlorella powder in this luscious nut spread made from raw tahini and naturally sweetened using agave nectar - a particularly delicious midday snack that’s ideal for those following a vegetarian, vegan or rawfood diet, as well as lovers of great-tasting food! Simply pop all of the above ingredients into a mixing bowl and stir thoroughly into a smooth, green paste. Spoon your freshly made chlorella nut spread into a jam jar and store in the fridge for future use. Try smearing generously on crisp slices of apple and top with desiccated coconut and your choice of dried fruit and nuts. Yum! Chlorella was first discovered by a Dutch microbiologist in 1890. Chlorella derived its name from the Greek word ‘chloros’ (green) and the Latin word ‘ella’ (small). Chlorella algae are microscopic and boast a diameter of between just 2 and 10 micrometres. The chlorella algae used to make chlorella powder is cultivated in round ponds that produce some twenty to thirty tonnes of dry matter per hectare - more than any other crop. The oil found in chlorella is also used to produce bio fuel. Chlorella is also available in a handy tablet form. 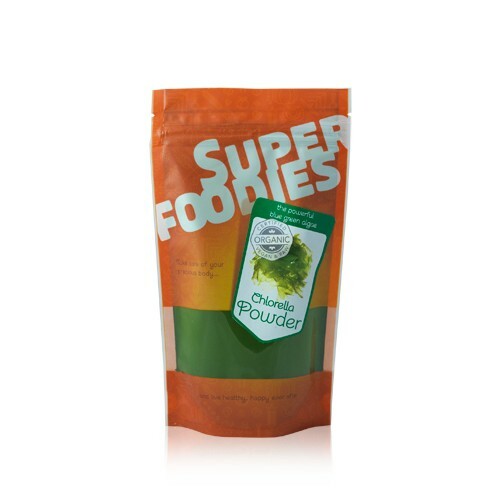 This is still the same amazing Chlorella Powder from Detox Your World, but now in a beautiful new Superfoodies bag! Everything remains the same except the bag. Continue to take advantage of all the wonderful green benefits that Detox Your World Chlorella Powder has provided over the years. Chlorella powder is gluten free. Chlorella powder is not suitable for those with an allergy to iodine, algae, chlorella or spirulina. Always read the enclosed product information, before deciding to use chlorella powder. Packaged in an area where nuts are processed. Stir chlorella powder into smoothies, shakes, juices and other drinks, or use to enhance (rawfood) recipes. 1 tsp. once or twice daily, preferably at mealtimes. Chlorella powder may cause temporary detox. Where there is an oestrogen deficiency, chlorella powder can cause a decrease in bone mineral density. Do not buy chlorella powder if you suffer from phenylketonuria or an autoimmune disease, such as lupus or rheumatoid arthritis.